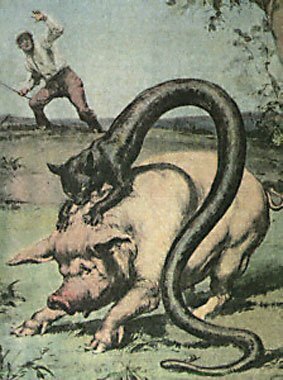 The Tatzelwurm truly tests the accuracy and efficacy of cryptozoology, as its existence remains a hotly-contested subject for debate. While there is a lot of anecdotal evidence to support the creature's existence, others have completely written it off as folklore and legend. To be sure, the legend is incredulous: A seven-foot, serpentine creature with the head of a rat and shiny, possibly scaly, skin. Its mode of transportation is even more disturbing, as the tatzelwurm is said to coil itself and spring toward its victims, biting and scratching them with its short forearms. The tatzelwurm's origins are rooted in antiquity, first being mentioned in 1779 in the Swiss and Austrian Alps. Reports grew more frequent in the late 19th-Century, but no tatzelwurm was ever produced. A skeleton discovered in 1924 was purported to be that of the tatzelwurm, which was so well-known as to have three distinct names (stollenwurm and springwurm being the other two), but it was never proven to be. Many believe the creature did exist at one time, but has since fallen extinct.